I’ve decided to add The 305 to my blogroll. They are based out of the Miami area and I’ve been reading their blog on a regular basis, since I’m going to be heading down there within a month. They have regular updates on music, fashion, food, and women (everything a guy could want) from the Miami Wade Dade County area. “The significance of “305” goes deeper than just being an area code of where we’re based out of. It’s a symbol of pride and a symbol of lifestyle. 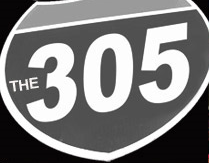 The305.Com has stood and will stand to cover hip-hop, fashion, sneakers and lifestyle from the eyes of a Miami perspective. The305.Com is focused on quality over quantity. The interviews have always been a highlighted mark of the website with exclusive photography and introspective journalism. We also give veterans and young hopefuls alike, a chance to display their showmanship as artists through one of our many music sections. Everything from events, graffiti, fashion models, radio shows, and editorials have all been points of interests that The305.Com has been able to showcase to our viewing audience. The future of The305.Com looks very bright. As our passion continues to grow, our success will grow with it. Our dedication and originality are single handedly the dividing factors to set us apart. Tons of interviews with today’s brightest stars, celebrities and business impressarios are soon to come. So if your bored and just surfing the phenomenon that is the world wide web, give em a look.